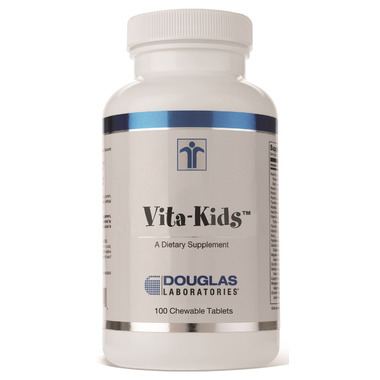 Vita-Kids™ provided by Douglas Laboratories® is a great tasting, chewable multiple vitamin-mineral trace element supplement designed for children age three and up. The unique teddy bear shaped VitaKids™ chewable tablets provide 27 vitamins, minerals and trace elements in bioavailable forms and nutritionally meaningful amounts. Vita-Kids™ is more than just another children’s multivitamin-mineral supplement. Research shows that above RDA amounts of many vitamins may have significant positive effects on the structure and function of growing bodies. Compared to major brands of children’s chewable multivitamins, the convenient chewable tablets of Vita-Kids ™ provide several times the levels of the important antioxidant vitamins C and E. Vita-Kids™ also delivers significantly more than the levels of most B-vitamins of brand-name vitamins, and provides easily absorbable calcium and magnesium, as well as a full spectrum of bioavailable trace elements. In fact, VitaKids™ is one of the most complete children’s chewable multivitamin/mineral formulas on the market. In contrast to typical children’s vitamins, vitamin D is intentionally kept low, because it can be potentially toxic in high amounts, and regular diets already provide generous amounts of vitamin D. Vita-Kids™ uses only the purest, most hypoallergenic ingredients and contains no artificial colours, flavours or preservatives. Indications: Vita-Kids™ is ideal for children that are at risk for vitamin, mineral and trace element deficiencies due to sub-optimal dietary intake, and life style. Suggested Use: (3 to 8 years): Take 1 tablet or as directed by a health care practitioner. Adolescents (9 to 18 years): Take 1 tablet twice daily or as directed by a health care practitioner. Take with food. Take a few hours before or after taking other medications. Other Ingredients: D-fructose, ascorbyl palmitate, cellulose, Xyletol, citric acid and natural grape flavor. I was excited to order these, but when my kids tried them, my daughter spit it out immediately. My son ate his no problem (he will eat just about anything). I decided to try one, and I found the flavour to be way too tart. Actually made me do a sour face. They are also quite large in size. My two sons liked this product. The grape flavoring is really strong and they have an strange minty type sensation as well. These are fantastic quality but only 1 out of 3 Kids will take them. We will continue to purchase for him. We use these for our 3 year old... he likes them, and this was recommended by our doctor. One of two kids liked this product. My kids love these tasty little gems and I'm very happy with the quality. Highly recommended as a good multi vitamin for kids.